India's intelligence agency warned as recently as November 18 that Pakistan-based militants were preparing to launch an attack on Mumbai - warnings that the Indian authorities are now accused of ignoring in the months before gunmen stormed the country's financial capital, killing at least 174 people. Indian and European intelligence officials tell CBS News correspondent Sheila MacVicar the information gathered was specific enough to cite threats to Mumbai's main hotels, and the possibility that Islamic militants might use boats to penetrate the city's weak coastal defenses. The investigation into last week's attack is still developing, but law enforcement officials have said about 10 well-armed, well-trained terrorists came ashore on small boats Tuesday night before methodically ambushing guests at two of Mumbai's most exclusive hotels. The head of an Indian fishermens' union says he warned the government that militants were using sea routes to smuggle explosives four months ago, reports MacVicar, and a captured Lashkar-e-Taiba operative told Indian interrogators months ago that he had carried out reconnaissance of both the Taj Mahal and Oberoi hotels. 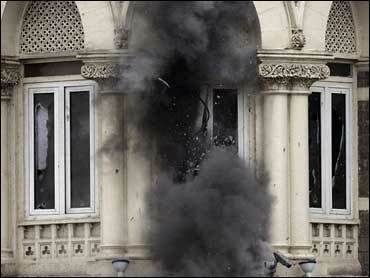 Lashkar-e-Taiba, or LET, is the Pakistan-based group increasingly suspected as being behind the Mumbai attacks. Intelligence sources tell CBS News that the LET is still getting some level of logistical and financial support from members of Pakistan's powerful military spy agency. A senior U.S. intelligence source told CBS News that in mid-October, India was warned by the United States of terrorist plots against hotels in Mumbai. The U.S. had received intelligence that Lashkar-e-Taiba cells had been engaged in reconnaissance. The one gunman captured alive after the attack in Mumbai has admitted to interrogators that he was a member of the group, according to senior Indian police officials. It quickly became clear during the siege that the gunmen knew their way around the massive Taj Mahal hotel. They deftly maneuvered through the vast complex, drawing out a standoff with police surrounding the building for 62 hours. "They seemed to know their way around... the back office, the back part of the hotel very well, the kitchen and so on. So, one assumes that there has been a considerable amount of detailed planning," Ratan Tata, owner of the Taj Mahal hotel, told CBS News. Tata also acknowledged security was increased at the hotel in October, following threats, but that it was then relaxed just days before the attacks. And, MacVicar reports, the threat may not have passed. According to a leaked account, the lone surviving terrorist suspect, Ajmal Amir Qasab, has told police interrogators that 24 men trained for the operation in Pakistan-based camps run by LET. Only 10 terrorists (nine dead, and Qasab) are accounted for. Some Indian police sources say that on an abandoned fishing trawler, hijacked by the terrorists to take them close to Mumbai, they found 15 winter jackets, 15 toothbrushes and other supplies, strongly suggesting there may be a continuing threat from five terrorists, whereabouts unknown. "One of the problems is that they had so many warnings that they didn't know which ones to take seriously," said Michael Clarke, a terrorism expert and director of the Royal United Services Institute. Clarke told CBS News that India's counterterrorism apparatus is in bad shape; used to getting so many warnings that they've become "out of the habit of taking them seriously." "If you look at the pattern of attacks there (there were two previous attacks in Mumbai) it's astonishing that it's not better," said Clarke. Senior Indian government officials, including ministers, have already resigned, but angry protesters have been taking to the streets, demanding to know why all the warnings were ignored.